Every time the weather begins to shift from cold to warm I am itching to introduce new separates into my wardrobe rotation. Last spring I made several garments based on a yellow color scheme and you can see that post here. This year I chose to make blues the focus of my mini collection mostly because I spotted this gorgeous jacquard double knit and wanted to build everything around it. It's now sold out but there are other double knits still available that are really cute here, here, and here. I also wanted this collection to be more casual than my collection last spring so I used mostly knits. 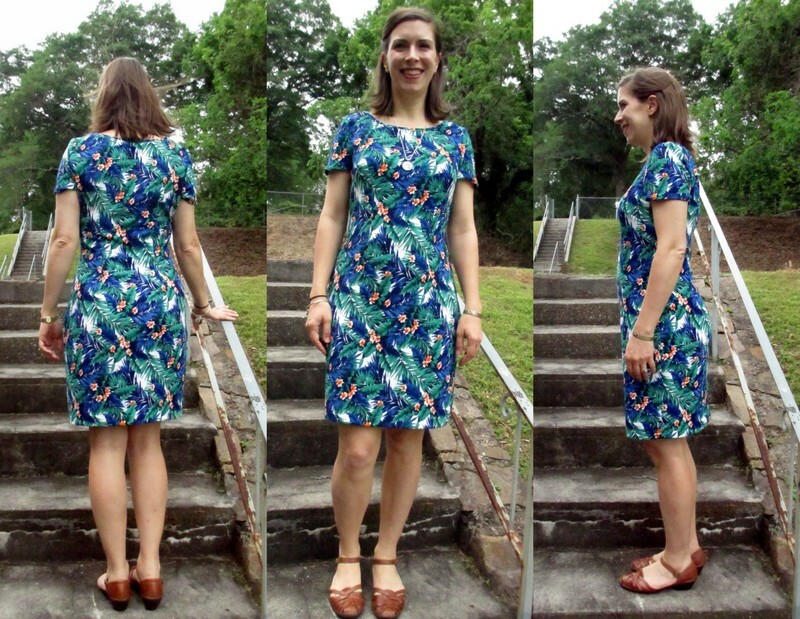 For date nights and church I put together this tropical dress. I love wearing it and already found that I want to reach for it again and again. It was made with McCall's 6355. The fabric and pattern worked perfectly together, the thickness and texture of the fabric and the optional shaping in the pattern were a match made in sewing heaven. This pattern is also awesome in that it is great at letting the colorful fabric do the talking. The fabric's texture is very forgiving for a form fitting dress like this one and minimizes any lumps or bumps. Its also very comfortable and although the dress is form fitting it is not constricting in any way. For my next outfit I used three different knits. I made the skirt using Simplicity 1283 and the jacquard double knit mentioned above. I can't say this was the best match of pattern and fabric but it is obviously very wearable and works for this outfit. The sweater and sleeves from the top were made with a navy striped rayon knit pre-cut fabric. There are a few pre-cut fabrics left here but essentially all are sold out. The white fabric was from my stash. The top is Simplicity 1317 and is a great basic loose fitting raglan tee. For the sweater I used McCall's 7484 and have worn this so many times since making it that I am beginning to wonder why I haven't made another! For the following shorts/tops outfits I used the navy striped rayon/lycra pre-cut knit and a snakeskin print rayon crepe pre-cut. They are both sold out, so sorry! What can I say, when Fabric Mart has a sale, fabrics fly off the internet! However a good pairing for a similar outfit might be the following: Black/White Stripe ITY and Taffy Pink/Black/White Rayon Challis. Or wouldn't this awesome Challis Shrimp print make adorable summer shorts!!? I used Simplicity 1167 for the tank top and Megan Nielsen Flint Pant/Short pattern for the shorts. I was a pattern tester for the Flint pant and this is the first pair of shorts I've made from the pattern. 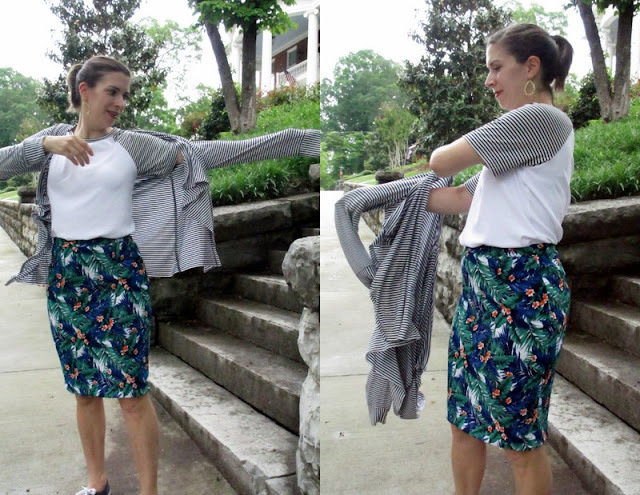 A challis or rayon crepe is a good choice for this pattern however- fair warning- the slippery/drapey nature of these fabrics make for a bit of a challenge in sewing, but these same properties make them very breezy for summer heat. The T-shirt is an altered out-of-print McCall 6796 turtle neck pattern. Needless to say I have a lot of stripes in my wardrobe top rotation now but I am a stripe fan and find it a great pairing for a shorts with a great print. Tees and tanks play a central role in my casual summer wardrobe so it feels good to have them all ready for our quickly approaching sweltering summer! I wanted one more outfit for this group and turned to my knit stash purchased some months back. This red knit is a modal/lycra and I believe it was a Julie's Pick fabric. This was the first time I have ever sewn with a modal knit and while it was super soft it was also super slippery, so my walking foot came to my rescue. 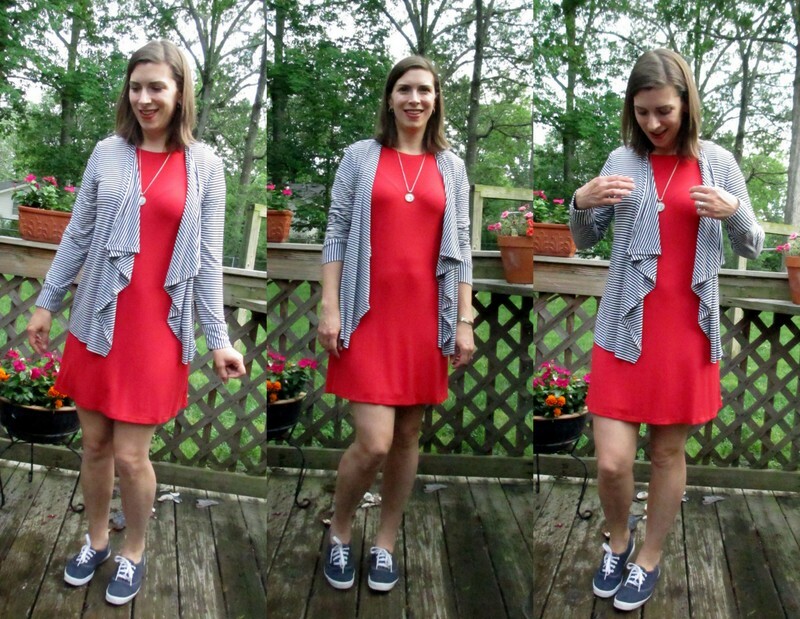 This little red dress is a great casual basic and I used my TNT McCall 7348 which I have made previously here and here -again with some of the width at the hemline removed. I am thrilled to have so many new casual separates and when perusing these pictures I hope you feel inspired to plan your casual wardrobe basics too! Love that red modal/lycra fabric! Beautiful dresses all of them and I too love a T dress for the summer - cool, easy on and off and always looks "dressed" too for day or evening. Thank you Kathleen! You are right, a good T shirt dress is hard to beat in the summer! Beautiful and versatile pieces, Elizabeth! Love it! Thank you Ann! They were fun to sew and coordinate! Love your mini wardrobe! The fabrics and prints work so well together.